Everyone is a unique individual. This is as close to an axiomatic truth as I have ever come to discover. It is very nearly a simple tautology, descriptive of the natural state of affairs. And while it is not a novel revelation, it is one of those simple facts that while readily agreed to by most is very often neglected in terms of consequence. It is also a source of great difficulty for systematic processes which seek to deal with people in the more general terms of categories and roles into which no one fits exactly because those categories and roles are purposely defined vaguely so as to encompass more than a single individual and in many cases to include as many individuals as possible in what is often a futile attempt to improve efficiency (I say futile because the de-individualizing of such efforts often resultsin redundancy, wasted effort, and even resentment which in turn negatively impacts overall operation). That is why these processes address sales clerks, employees, or citizens rather than Bob, John, Jane and Sue specifically. Unfortunately though, it is the systems that are far faster recognizing and adapting to the fact that everyone is an individual than individuals themselves. One consequence — perhaps the primary consequence — of recognizing yourself as a unique individual is that of making a choice to either embrace or attempt to reject your unique individuality. To put it another way, you must decide whether or not you will define yourself or allow yourself to be defined. To define yourself is not simply to be different. You are already different. Self-definition occurs through a process of consciously evaluating and choosing from among your options on the basis of your personally selected merits and values. It is not a one-time-only decision, but rather an ongoing process throughout your life. The expression of making such choices can be expressed in a great many ways — including but certainly not limited to (consider the decisions of those who choose to select their own names rather the ones which they are given at birth in order to better reflect and express who they are) body modification and ritual. Body modification and ritual can also be used as an aid to the decision making process. Because body modification and ritual are not only powerful tools for self discovery and definition but also stand as strong and potentially influential statements to others thereof, they represent a significant threat to those who reject their uniqueness and the systems and processes that rely upon viewing people as members of a category or their designated job title. There are two basic responses to this threat. The first and most obvious are the attempts to restrict and deny body modification and ritual. These attacks range from social stigmatizing and discrimination to school bans and workplace dress codes all the way to legislative attacks such as the various anti-‘tongue splitting’ bills (see my article The [Modified] Body Politic for a discussion of how these bills are almost always patently unconstitutional in their bias and redundant at their best) which have been introduced around the US recently. These attacks are generally easy to spot and while very onerous in their nature, they represent the least of the threat. Of greater concern is the more insidious response, whereby body modification and ritual are adopted as method and controlled by those who oppose the full realization of each our unique individual natures. The grossest example of this would probably the use of tattooing and similar techniques to mark slaves, criminals, and war prisoners. By doing so, the subjects were demoralized through the loss of control over their bodies and made readily recognizable and classified as a category or type. However, such gross examples are in some ways less threatening because they are so bold and obvious. It is hard to imagine such actions being taken today without incurring serious resistance. That is, of course, if they are attempted in a sudden and immediate fashion. But the danger is still there, for those systems and organizations are quick to adapt and refine themselves. They realize that it can be far more beneficial and easier to gradually introduce and adapt people to accept their forms and goals for body modification and ritual. They may even promote it to the extent that they find their subjects will behave better if allowed some small (lesser) form of latitude. In time, they may even delude people so far as to willingly take on the roles and categories they are assigned while thinking that they are actually acting in a self-defining manner. Consider the prevalence of body modifications such as tattooing and piercing in pop culture media and advertising. In advertising there is usually a twofold process of deception — each depends on blatant fallacy which is disguised by being introduced on the alleged (and false) assumption that they follow from the position of admitting that everyone is unique. Simple difference is not expressing or embracing your individuality; nor is it self-defining as mentioned above. The purchase of any mass-produced item will hardly differentiate you. So, not only do they make a false claim that you can define yourself through difference but then they fail to even offer you something that would achieve that difference. Also, the thrust of this sort of move on their part is to get you to identify yourself with products rather than defining yourself and then expressing your identity through your use and choice of products (customization often being a good overt example). It can be a subtle difference to discern but it makes all the difference in the world. Advertisers will include the use of body modification and ritual in order to further the idea of difference and to provide powerfully impacting images. However, the modifications and rituals used will be carefully selected based upon those most likely to be accepted by the dominating social systems of the time and region (or selected marketing focus) and will thus promote those particular examples in much the same way as is done in the rest of the media. Media, particularly pop culture media, is a double-edged sword when covering modification and ritual. Positive portrayal of these subjects is certainly something we can applaud. But, attention must be paid to how and what subjects are focused upon. Look closely at the coverage and you may very well see the systems at large playing a dangerous game. They are willing to risk promoting all such behavior in an effort to control it by using the media to show the positive sides of some instances (bonding rituals, memorial and fraternal tattooing, and so on) and negatively discussing others or leaving them unmentioned entirely. In so doing, they wager that the majority will end up channeling such urges in the accepted and promoted fashions. However, they also continue to characterize it as a fringe activity (despite its true prevalence and extent — consider my What is Body Mod column) in an effort to draw more within their grasp and retain those who may be moving towards resistance. To this point, I have primarily been involved in a discussion of theory. Now I want to turn to a discussion of practical application of theory. The unexamined life is not worth living because it is at best a pale imitation of life. So, examine your life. Devote time and consideration to your motivations, decisions, and goals. Take hard looks at them all. Actively engage in the process of self-definition. Make a concerted effort in all things to assert and express yourself as an individual rather than as a category or role. Do not refer to or treat others in a generic fashion or in terms of a role or category. Everyone is a unique individual, just as you are, and thus offers you a singular experience in your interaction with them. By sharing expressions of your own self-definition and treating them as individuals you can stand as an example to them and help them embrace their own individuality. Many people have asked me how I deal with answering the same questions over and over again on a daily basis. The answer is that I don’t — the questions are not the same because they come from different people, each asking and reacting in their own way and for the first time for them. Upon consideration I suspect that this is actually the only option given the nature and structure of government as we know it and has always existed. Government may come to allow body modification and ritual to a great extent in enlightened self-interest but in its current and past forms would never relinquish the claim to the citizenry as property. So, just as one should always recognize one's self and others as individuals, one should never make that mistake of a system. Rather, recognize that the system is made up of individuals and identify and address them as such. No matter how strongly they have been conditioned or come to think of themselves as secretary or cop — they are individuals and by embracing their individuality you show them the path towards embracing it themselves. You also stand a much better chance of successfully navigating the system. This is the chink in the armor of the system — it depends on its components to function as that which they are not. Exploit this but not the individuals. This can be as simple as addressing people by their names rather than titles or utilizing their personal interests in order to establish a connection that will make them less likely to treat you as a category or type but rather as an individual yourself. For practical techniques, I suggest that everyone look to texts like How to Win Friends and Influence People or The Golden Rule of Schmoozing (a personal favorite and written by a friend of mine) and employ them with the added intent of aiding those who do not fully embrace their uniqueness. Doing so not only increases personal gain but can help to break others out of the conditioning to reject their individuality by treating them as individuals and rewarding them for acting as such. 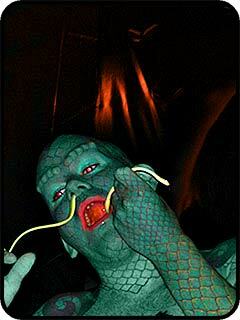 Former doctoral candidate and philosophy degree holder Erik Sprague, the Lizardman, is known around the world for his amazing transformation from man to lizard as well as his modern sideshow performance art. Need I say more? Copyright © 2003 BMEZINE.COM. Requests to republish must be confirmed in writing. For bibliographical purposes this article was first published November 13th, 2003 by BMEZINE.COM in Tweed, Ontario, Canada.